I just read an early Ruth Rendell novel, From Doon with Death. 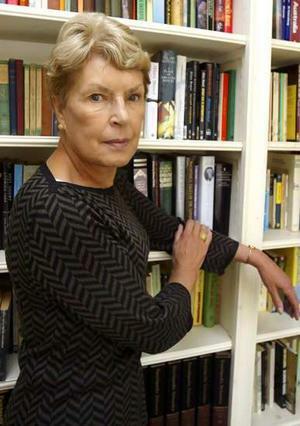 Rendell is famous for bringing a new level of psychological sophistication to the characters in mystery novels, a technique she used in blatant rebellion against the Agatha Christie style of cozy mystery. What I was most struck by in Rendell's writing, however, was her tireless attention to the experience of scene. By this I mean that the reader always knows what it's like to be in the place where the characters are. It's done through descriptions of the five senses, of course, but as applied to details that might not seem to a lesser author to be worth relating. Part of Rendell's understanding of human psychology, I guess, is the realization that we all notice the oddest things about our surroundings, even when we're in the middle of something important. It's a great feeling to know that my fiction had the intended effect on the reader. I hope to get that feeling over and over during my career. Jean Paul Richter, the Romantic novelist who wanted to be the first person ever to write down everything he thought, would not have fared well on Twitter. I'm hoping I can adapt to a new standard of concision. Well, this fiction-writing thing might just work out yet. I just found out I won Second Prize in the Children's Writer Historical Fiction short story contest. I could not be more thrilled. My story, "Stronger Than Magic," is about a Thracian slave boy who asks the famous doctor Hippocrates to save his sister's life. All that classical education came in handy once again. Not much substance or thought to today's post. I'm too happy to ponder. Being fairly new to this kid-lit biz, I have a lot of catch-up reading to do. (Thank you, I shall now accept the prize for silliest understatement.) In terms of the coolest/hottest middle-grade novels, I'm a few years behind. So pardon me for being late to the Savvy party. Ingrid Law's Newbery Honor book has magic, realism, wit, pathos, excitement, and truth, and requires at least three Kleenexes to get through. (Re-mopping my bleary eyes was as necessary as windshield wipers on a rainy day.) "Savvy" is the term for a supernatural power each member of this special family discovers in him/herself at age thirteen. But, as the main character figures out, it is also a metaphor for the unique, innate talents in each of us. A mark of a great book of speculative fiction is the way the apparent magic is really an analysis of ordinary human behavior. 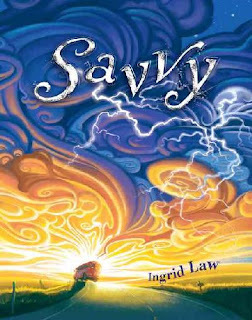 If you have middle-schoolers in your life, or love a good kids' novel, be sure to get yourself some Savvy. Now I look forward to the recent sequel, Scumble. Anyone else out there go to the SCBWI conference? There were over a thousand folks, so I may have missed you. For those who don't know, that's Society for Children's Book Writers and Illustrators. All the members and officers refer to it by spitting out all those letters, "S-C-B-W-I." I shall never understand why they don't just pronounce it "SKIB-wee," like I do. Anyhow, it was a fun conference. I met lots of nice people, but didn't make a lot of well-placed connections. (There's a big difference between those two things.) The talks by agents and publishers were informative, but I'm not sure how immediately practical. The talks by famous authors were fun, particularly R.L. Stine, who wrote the Goosebumps series. If I'd sold 400 million books, I'd be a barrel of laughs, too. Unsure whether I'll be going again next year. It seems to be geared toward total newbies, and I guess I'm not one of those. I think I've graduated to second grade in children's publishing!